I like pasta and buying fresh pasta is something I like to do assuming that I’m planning on cooking it within a couple of days. The Fresh Ravioli with Tomato & Mozzarella comes in a fairly simple package and is made from Irish ingredients – at least in part: ricotta cheese, Irish mozzarella, tomato concentrate, potato flakes, parmesan, cheddar, pecorino cheese, whey powder, milk powder, oat flakes, salt, garlic. I cooked it this afternoon and while it was tasty – served with a sprinkling of freshly grated parmesan – I’m not sure if it was worth paying the premium price. While I like being able to support local business there is a line – paying almost double for the “pleasure” is a bit much. Chicken is not only tasty, it’s also one of those things that you often find on special offer in a lot of supermarkets. 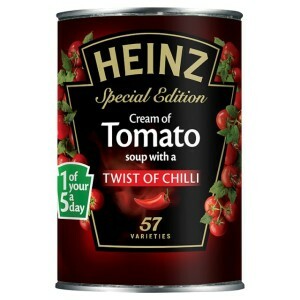 When I was a student in Limerick I used to pick buy it regularly and cook it in a number of different sauces. This recipe is inspired by one of those supplied by Tesco Diets (now defunct). They call it a Provençal chicken, though I’m not sure if that’s really accurate. 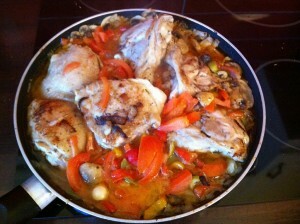 If anyone knows of a supermarket or butcher that sells chicken thighs already skinned I’d love to know about them! I’ve tried skinning chicken thighs in the past and it’s a lot of pain for very little gain. 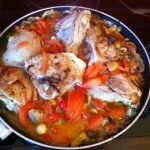 So I’ve been cooking chicken thighs with the skin on ..
Add the tomatoes, mushrooms, garlic, herbs and olives. Do not skin or chop the garlic - it needs to be cooked whole "as is"
My sister finally answered the question that had been driving me mad for the last couple of weeks. How on earth can you slice pitta bread open without losing your mind? The answer is incredibly simple – just pop them in the toaster (or microwave) for a few seconds first. Once they’ve been heated up a bit you’ll be able to slice them open quite easily. So this afternoon I put this new knowledge into action when preparing this quite tasty snack. If you like cheese you'll love this, as it's got plenty of it! Heat the pitta bread for about 30 seconds in the microwave or toaster. The recipes provided by Tesco Diets are pretty good and varied, but I’ve ended up reworking quite a few of them. Either because I didn’t quite have all the ingredients (finding ricotta in Tesco proved impossible, though SuperQuinn did have it) or I needed to finish off an open pack of something. 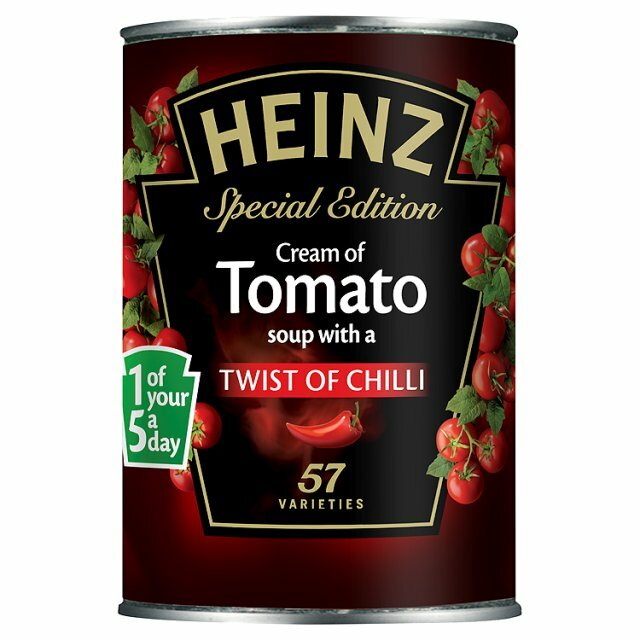 Bearing in mind that I have to keep my daily intake of calories to within about 10% of their recommendation it’s not that hard to swap things around a bit and add more vegetables etc., Obviously if you add stuff that’s high in calories then you’re going to have problems maintaining your daily quota. (I know the diet takes into consideration more than just mere calories, but it’s the easiest thing to keep an eye on when you’re tweaking). This is really tasty, but the pitta might fall apart so make sure you have a knife and fork to hand when eating it! Slice the chicken into thin strips / pieces. Pitta bread is incredibly versatile. You can stuff it with a whole range of different things and make really tasty meals. I made this for a late lunch today and simply doubled the quantities from the original recipe I had and also added some other bits and pieces to it. Slice and dice the tomatoes and onion and mix with the tuna and herbs. Tonight’s dinner was meant to be a pasta sauce with ricotta, but I couldn’t find any in the supermarket when I laid in this week’s healthy provisions. I’ve been cooking pasta (and eating it) for as long as I can remember, so tweaking a pasta based recipe isn’t that much of a challenge. I also found that the quantities in the recipe were going to render it incredibly dry (1 tomato with a bit of tomato puree doesn’t go very far), so I added a bit more to it. The end result was incredibly tasty and remarkably low in calories. If this is the kind of food I need to eat to lose weight and improve my health, then this diet isn’t going to be that much hard work! Heat the oil in a non-stick pan and cook the onion, garlic and pepper until slightly softened. Add the minced beef, turn up the heat and continue to cook until the beef is browned through. Add the diced tomato, tomato puree and herbs and simmer for 20 minutes. Meantime, prepare the pasta following package directions, omitting any suggested fat or salt. 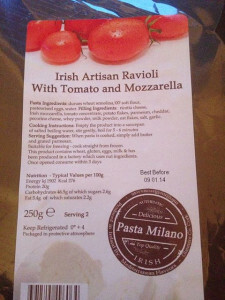 Stir the philadelphia cheese into the beef mix and serve this with the pasta, sprinkling with Parmesan cheese.